Letter from LP to Prof. F. T. Wall RE: looks forward to seeing his manuscript on chemical thermodynamics. 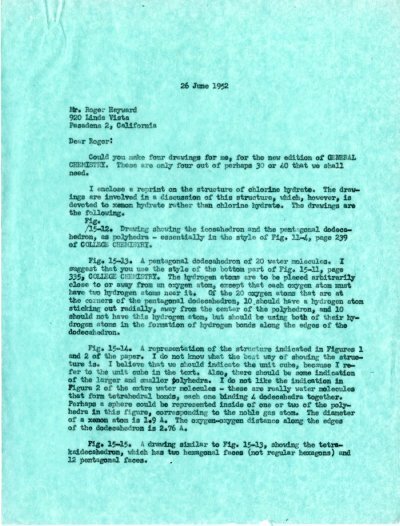 [Letter from Prof. Wall to LP June 20, 1952]. Prof. H. D. Springall to LP RE: introduces LP to his "right hand man" Dr. P. H. Plesch, and asks that he meet with him. Writes also that he was disappointed that LP was unable to attend the Royal Society Meeting on Protein Structure. Congratulates LP on his papers with Corey on X-ray work. Mentions the deaths of Lindsay and Sidgwick at Oxford. [related note from Dr. Plesch to LP February 8, 1952, letter from Prof. H. D. Springall March 24, 1953] [Filed under LP Correspondence: Box #367, Folder #6: File (Springall, H. D.)].